Teutopolis (population: 1,530) is located in east central Illinois in Effingham County. US Route 40 (also known as National Road or the Cumberland Trail) is the main thoroughfare thru the community, which is just three miles east of the county seat, Effingham. Interstate 70 passes a few miles north of Teutopolis (also known as "T-Town"), and Interstate 57 intersects with it by Effingham. The community is known for its German heritage, as Teutopolis in German stands for "home of the Teutons (or Germans)." It was founded in 1839 by immigrants from the old country who were looking for land that was suitable for farming, had plentiful game, and drained well, which was uncommon since most communities were founded by the placement of railroads or stage coach trails. More about its' history can be found at: http://www.teutopolis.com/History__Additional_Info/126/a. St. Joseph Minor Seminary was opened by the Franciscan Friars of Holy Cross Province of Saxony (aka the Franciscans) in 1862 in Teutopolis at the request of the Bishop of Alton, who wished to start a college for seminarians and Catholic lay students as a training ground for priests who would eventually serve the parishes in the Alton Diocese (which at the time, encompassed the southern third of Illinois). Named St. Joseph's College and Seminary, it became reality on September 16, 1862 when 58 students and eight seminarians began classes. The Franciscans became overwhelmed within a few years with fulfilling needs in education and missionary work, so the seminary was closed in 1865 in order to focus on the college, which was also known as St. Joseph Ecclesiastical College. A six-year classical course of study was offered from that point. In February 1898, the Friars decided to change things around by admitting students that wanted to become part of the Franciscan order, and the name changed again to St. Joseph's Seraphic Center as it admitted students that wished to attend the preparatory (or minor) seminary. 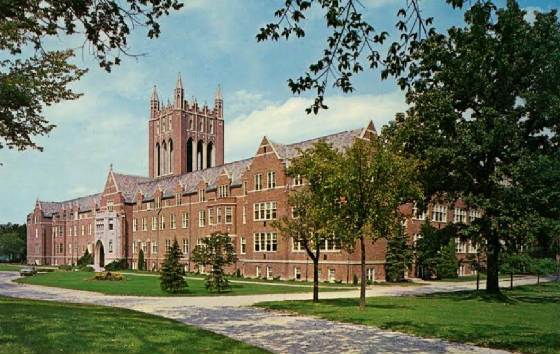 St. Joseph remained open as a preparatory seminary in Teutopolis until it was transferred to Westmont in the western suburbs of Chicago in 1927. At that time, it was offering a six-year course of study with the first four as a high school classical course and the last two for religious training. The remainder of the order along with other seminarians remained in Teutopolis until the mid-1960's when they relocated to the Chicagoland area. The minor seminary closed in 1978 in Westmont, but the Franciscans' presence is still alive in Teutopolis. 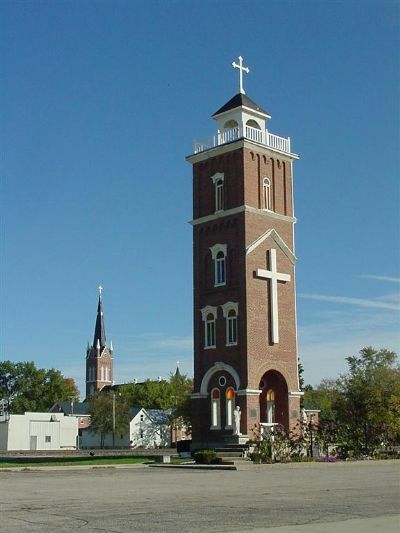 Today, a memorial tower remains standing as a reminder of the former school in Teutopolis, and a museum has been opened in the former living quarters of the friars adjacent to St. Francis Church in T-Town. In researching the school history, we were unable to find proof that the school offered extra-curricular activities for its students. One would believe that St. Joseph's could have offered intramural sports for the all-male student body, along with other clubs. We are hopeful that an alumnus can tell us more about their experiences at the school, and fill us with details at the addresses given below. "I was viewing the page associated with the above title and noticed that the school colors and nickname were marked as “unknown.” I attended this seminary from 1966 to 1970. The school colors were blue and gold. The school nickname was the “Lakers” because of the 3 lakes that existed on the property." "My name is Michael Lorch. I attended St Joe's from 1970 through 1975. While there I worked on the farm with Brothers Art, Rock, Pat and Damien. After graduation I continued to help out on the farm until 1977." "I had the privilege to grow up in Teutopolis, IL and attend St Joseph's Seminary at Westmont, Il from 1962-63. During my one year at Westmont, my great uncle, Father Fabian Merz, PFM, was the head of the seminary. We did play sports against local schools, but because we were cloistered (not allowed off the school ground during the entire semester), the local school teams came to us. "I remember basketball and baseball were played, but don't recall any other sport played with local schools. Internally, because of the 3 large lakes we were able to play intramural ice hockey when the lakes froze hard enough. It was a tough transition to take a small-town boy/farm kid, who was used to being outdoors and free to go where he wanted, and cloister him for an entire school year. "The seminary life was very strict. Our bedroom was very large and had over 100 boys sleeping in the same room. I was 6'3" tall but my bed was a 6' old metal frame with a very saggy spring center and thin mattress. We couldn't talk except after a bell was rung during meal times and during exercise time. We went to daily Mass in the morning and another couple chapel times during the day. "Of course we had class in the morning and afternoon and could talk to the teacher. In my freshman year, among other classes, I took three languages: English, Latin and Greek. Even though I determined that it wasn't my vocation to become a priest, It was a unique experience for me and taught me many lessons for life." I was a student during the 1972-73 school year. We played soccer and travelled to different schools as well as them coming here. I also remember the three lakes and ice hockey games. The guys from the bigger cities gave us a bad time about figure skates to play hockey...they wore the real thing. I think I was the first one to do ice fishing on the lakes. We'd get an axe from the tool shed which Fr. Ambrose German maintained. He was from my hometown (Humphrey, NE) and a classmate of my mom's, so it didn't take too much talking to get tools. I had a supply of wax worms from my dad to use as bait. Our language classes consisted of Spanish and German."